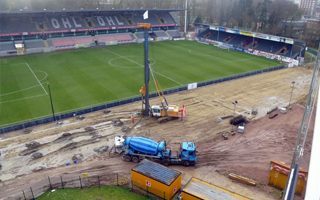 Stadion Den Dreef is undergoing the first phase of its complete overhaul. Its east stand is already gone as piling for future foundations has ended. Since January there were 165 piles installed between 8 and 10 meters deep to provide stable basis for future prefab grandstand. The new stand will be opened this summer and hold 3,500 people spread across two tiers of seating. Despite being built along the east side of the field, it will become the main grandstand with player facilities, club offices (250 square meters), corporate boxes (10), media zone and two cafeterias. Thanks to this first phase, the stadium will be able to meet all crucial criteria of the Belgian football league. Afterwards also the end zones will be rebuilt, all matching the existing west grandstand. The cost is estimated at €5 million. €4 million will come from interest-free loans from public authorities, €500,000 from a grant by the Flanders and the remaining amount from the skybox lease.